← Guangzou, China. January 29th, 2013. Alpine, California. February 22, 2013. February 23, 2013 (Alpine) – Yesterday’s water main break and sinkhole continue to cause problems for merchants and residents in Alpine, where a boil water order remains in effect to protect public health. Padre Dam indicates it may be up to 72 hours before the problem will be resolved. “In the meantime almost ALL of our Alpine restaurants had to close last night (on a busy Friday night),” Angela Brookshire, editor of the Alpine Community Network, told ECM. Alpine restaurants and other businesses have already been hard-hit due to two years of Sunrise Powerlink construction to underground the line, as well as county work on Alpine Boulevard. 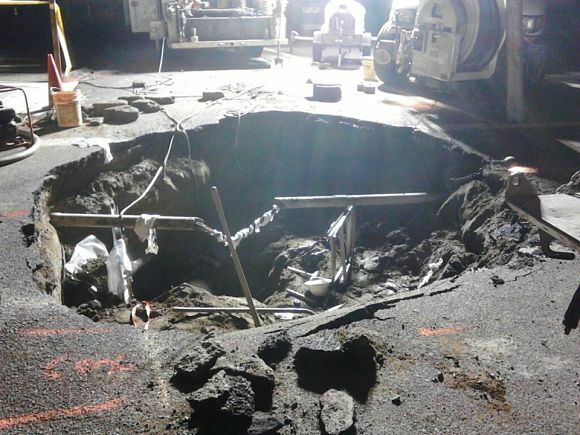 This entry was posted in Pictures and tagged Alpine, California, sinkhole. Bookmark the permalink.